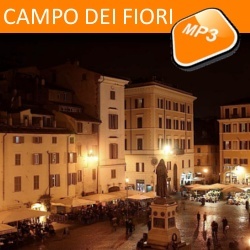 Description: The Campo dei Fiori is a lively rectangular square located close to the Piazza Navona. It is ringed by cafes and bars and every morning host a fabulous flower and veggie market; it is also a popular meeting place in the evening. It's on the border of the Regola and Parione streets. The name literally means ''field of flowers''.